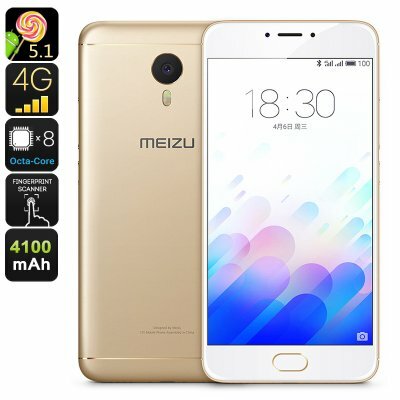 Successfully Added Meizu M3 Note Smartphone - Fingerprint Scanner, 5.5 Inch FHD Display, Octa Core CPU, 2GB RAM, Android OS, 13MP Camera (Gold) to your Shopping Cart. For anybody out there that is searching for an affordable Android smartphone that despite its cheap price comes packed with sophisticated hardware and lets you enjoy the latest mobile features – the Meizu M3 Note certainly is a phone to consider. Running on an Android operating system, this 5.5-Inch smartphone supports the latest features out there and provides a fast and powerful performance. No matter what kind of smartphone user you are, this budget Android phone is guaranteed to bring along a great user experience that meets the liking of all types of smartphone users. Holding two SIM card slots and featuring two IMEI numbers, this Dual-SIM phone allows you to be connected to two 4G network providers simultaneously. Additionally, Dual-IMEI smartphones bring along plenty of possibilities to separate your work and private life as they allow you to be reachable on two phone numbers while using merely one device. By letting you be connected to two separate 4G network providers, the Meizu M3 Note truly brings your mobile connectivity to the next level. Besides its 4G connectivity, this Chinese smartphone furthermore supports Dual-Band Wi-Fi. No matter whether you’re at home, in the office, or enjoying a cup of coffee in the city – with the Meizu M3 Note you’ll always be able to enjoy the fastest data speeds out there. Packing the Heilio P10 MTK6755 processor, this Android phone is capable of handling the latest of applications, games, and media at ease. Built for speed and efficiency, this Octa-Core CPU that has been clocked at 1.8GHz handles whatever you throw at it. Additionally, the Meizu M3 Note furthermore holds 2GB of RAM, letting you efficiently engage in multitasking sessions without needing to worry about slowing down your Android phone. Simply head out to the Play Store and download the latest mobile entertainment – with its powerful hardware, 128GB of external memory support, and massive 4100mAh battery, this Chinese smartphone lets you enjoy all your favorite media for hours in a row without dropping a single frame. Besides an ultra-fast fingerprint scanner, the Meizu M3 Note Android phone packs a beautiful 13MP camera at the rear of its design – truly setting it apart from the other budget phones in the market. Snap stunning images and shoot 1080p video – from now on not a single moment in life will pass by uncaptured. On its mesmerizing 5.5-Inch Full-HD display, this Chinese Android phone lets you enjoy all sorts of mobile entertainment and watch back all your pictures and video’s snapped with its 13MP camera in breathtaking Full-HD resolution.